Every week, Jews break away from their individual, busy work lives and enter into a spiritual together time with their loved ones and friends. The Jewish Day of Rest, Shabbat in Hebrew, begins on Friday at sundown and ends on Saturday at nightfall. Tables are set with white tablecloths, good dishes, candles, wine and challah loaves. And everyone sits down together to fill up on the good things in life—from reconnecting with their children to enjoying good food. Some people love the simplicity and predictability of serving the same menu for their Shabbat meals week after week. Others crave the chance to try out special new recipes or showcase seasonal produce in honor of the Jewish Sabbath. Some spend hours in the kitchen preparing for Shabbat, while others need practical shortcuts for making a great meal without a huge time investment. Whatever camp you're in, you'll find menus and recipes to love in this extensive collection of Shabbat menus and recipes. 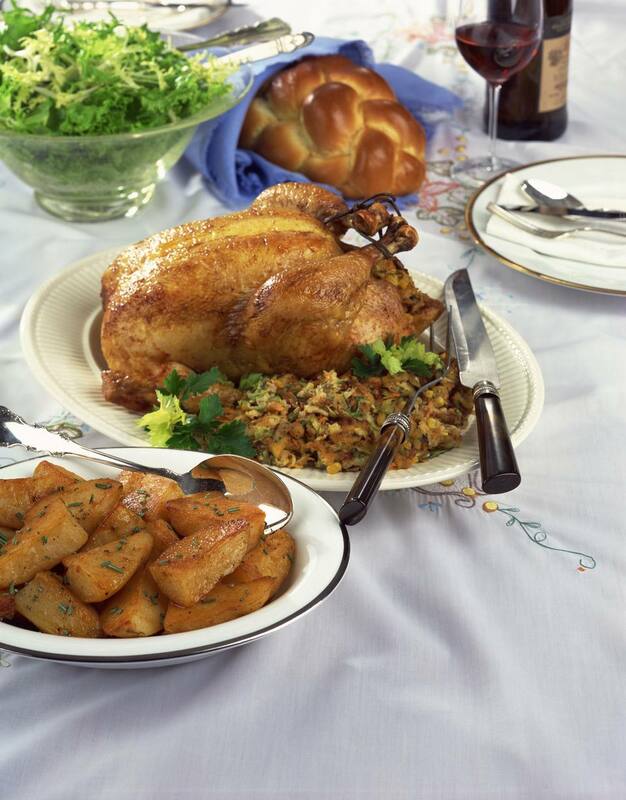 For Jews of Ashkenazi (Eastern European) descent, a traditional Friday night Sabbath dinner menu often looks a lot like this menu with homemade challah, gefilte fish, chicken soup, chicken, and asparagus. Plenty of the foods often associated with Shabbat—from challah and matzo balls to kugels and cakes—are rich in carbohydrate. But whether you're watching your carbohydrate intake due to a health concern like diabetes, or if you're a fan of Paleo or other lower carb diets and lifestyles, these low carb Shabbat menus and recipes should offer plenty of ideas for what to serve. Does your busy lifestyle make it difficult to find the hours needed to prepare delicious home-cooked meals for the Sabbath? Do you feel especially rushed with Shabbat cooking during the winter when Shabbat starts early? These quick Shabbat menus and recipes aim to help busy cooks prepare Shabbat meals for their families. Our teenage children like to invite their friends to join us for Shabbat meals. Naturally, we want to encourage our kids to bring their friends home, and we want our children to remember their home as welcoming and warm. In order to serve a large group of hungry teens while staying within our budget, we need a low-cost Shabbat menu for a crowd. These economical Sabbath menus are designed to satisfy big appetites—without putting a big hole in your pocket. October is the official "After the Holidays" month. And after three weeks of holiday meals (from Rosh Hashanah through Simchat Torah), I prefer to spend time in the gym rather than in the kitchen. So these fall Shabbat menus include quick and easy recipes for Sabbath meals. The cold hits in December, but winter still feels fresh and fun at this early date. These winter Shabbat menus include recipes for creamy vegetable soup, savory roast chicken, side dishes that make the most of winter vegetables, and rich chocolate desserts. Spring is here, and those long, hot, summer Sabbath days are just around the corner. Days for relaxing with family and friends, reading, resting and recharging our batteries for the work week ahead. These days call for light—but still festive—Shabbat menus. These spring Sabbath menus include recipes for grilled meat, barley and a variety of salads. Let's be honest—cooking in August feels something like swimming in January. In each case, the apron and the bathing suit feel out of season. But if you have guests coming for a Sabbath meal in the summer, you will probably want to serve a festive home-cooked meal despite the heat. These August Shabbat menus include quick recipes for light dishes that won't have you slaving too long over a hot stove in the heat.